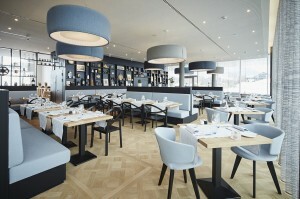 The Vaudois Riviera Near Vevey Switzerland Houses Great Cuisine, Wine and State Of The Art Modern Times Hotel. Our journalistic path has taken us to many countries over the years. Switzerland however has to be at the top of the list. It is diverse and never disappoints in its majestic grandeur and superb offerings. Once again, Switzerland surprised us with a hotel that has quite a surprising theme. Canton Vaud is located on north shore of Lake Geneva not far from Lausanne. There have been settlements here as early as the 2nd millennium BC.Under Rome, it was known as Viviscus or Vibiscum. This part of Switzerland is the French speaking region and lives up to it in all aspects of daily life. The town of Vevey is noted for being the final home of comedy legend Charlie Chaplin and his family from 1952 to 1977 and now showcases the newly opened museum honoring Chaplin’s work, Chaplin’s World. It is also known as the world headquarters of the food giant Nestlé, founded in 1867. And why do you ask? There is a long sweet history in this historic city. Milk chocolate was invented in Vevey by Daniel Peter in 1875. Arriving at the train station we were whisked away by our driver to the new Modern Times Hotel. As you enter, you can’t help but be drawn to its sleek contemporary design and original décor. The Modern Times is conveniently located between the lake and mountains at the heart of the Vaudois Riviera. Enjoy your room with a magnificent view of mountains and sweeping green while sheep graze upon the outside pastures. The Times Bar just off the lobby is a great way to spend some time and indulge in an array of snacks with a libation of your choice. After day of exploring Lake Geneva’s offerings and beauty or the nearby Chaplin’s World museum, you work up an appetite. 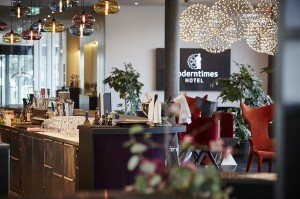 You don’t have to go further than Times Grill in the Modern Times hotel. This venue features a modern chic décor honoring the legendary Chaplin featuring panoramic windows, and whimsical depictions of the “Tramp “bringing a spirit of frivolity and fun to the dining experience. The huge outdoor patio offers world class vista views and unmatched tableside service. Our attention was drawn to the show-grill where guests can enjoy the open kitchen and dine on quality local products prepared right in front of them. The team of Chef exécutif ,Mr Fabien Thomas and Directeur of Food & Beverage, Mr Cyril Dederding, have teamed up to provide excellent cuisine, wine and hospitality. First off, enjoy Plat du jour. No matter what day it may be it will be excellent. The Escalope de foie gras grillé, topinambours, éclats de noisetteset chips d’artichaut (Grilled slice of foie gras, Jerusalem artichokes, hazelnut and chips of artichoke) is not to be passed up. For a tasty side dish Crème d’aspergesverteset blanches en duo, Belperknollefromage de vache au poivre) (Green and white asparagus cream, cow milk cheese with pepper) is the perfect complement to most of the dishes. Finish big and slice into La côte de BœufSuisse , 800g pour 2 personnes (Swiss T Bone chop,28.2oz, suitable for 2 people) . Pair it with a fabulous Swiss Wine from the area and you have a guaranteed hit. 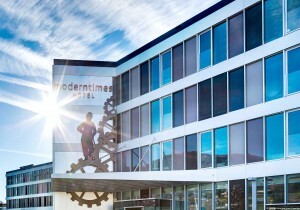 The Modern Times Hotel with its tribute to the iconic Charlie Chaplin is special. Whether you are there for business in historic Vevey or a vacation, their attentive staff, excellent dining and lounge options will provide a comfortable experience with a Chaplin touch.